As the fight for the next president narrows down, Super Tuesday declared Hillary Clinton and Donald Trump as the frontrunners for their prospective parties. What are the political views of the residents in our community. National Political Correspondent, Jack Wells filed a report on how the community is reacting to the developing electoral landscape. With Ben Carson’s impending end to his campaign, Super Tuesday had a decline in the number of candidates contesting for their party’s nomination. Jack spoke with local residents. Despite having lots of different views on who should win the nomination, the most important thing is that residents cast their votes on November 8th to have their voice heard. A reminder to residents have not yet registered to vote is that the last day to register is April 19th. OnFebruary 22nd, the Village of Mamaroneck became the first municipality in New York State to pass a law requiring Village pet shop owners to obtain dogs and cats from rescue shelters or humane societies in Westchester County or ones that are registered with the New York State Department of Agriculture. The Proposed Local Law “D” of 2016 passed with four of the five members of the Board of Trustees in favor of the legislation that targeted puppy and kitten mills. The law imposes a Village ban on the sale of commercially bred dogs and cats. Trustee Leon Potok abstained because of concerns of an appeal. He spoke to Lo-Hud about his thoughts on the new law. He said, “I am pleased we sent the message that our community abhors the inhumane treatment of animals of puppy mills, but I would have preferred following our counsel’s advice to first consult with the New York Attorney General’s office. I expect that the new law will prove legally defective”. The Local Live spoke to an employee at National Breeders Pet Store on Mamaroneck. They stated that ten people will be losing their jobs because the future of the pet store is not bright. As for the puppies, there are still twelve left and the owner is offering reduced prices to ensure that the puppies will find loving homes as soon as possible. Village Manager, Richard Slingerland told the Local Live that Law D has been sent to the Department of State and once it’s been officially filed, it will go into the effect. We will be all the latest developments of the Dog Law when it goes into effect. Since May of 2014, the Mamaroneck Board of Education has been considering the possibility of letting Open Door, a non-profit medical provided, operate a school-based health center at Mamaroneck Avenue Elementary School. The school-based health center will be a primary care pediatric clinic located within the school. Currently, there are more than 200 of these centers operating in New York State. Open Door has five school-based health centers in Port Chester and one in Ossining. They provide preventive care, sick visits, Asthma management, as well as free programs to reduce obesity. There is no cost to the school district other than utilities and custodial services. The success of the school-based health center in Port Chester drew the attention to the Community Resource Center, formerly known as the Hispanic Resource Center. The local non-profit serves a similar low income population as Open Door and has been long concerned with the lack of health services in Mamaroneck for families without private health insurance. Mamaroneck Avenue Elementary School was chosen by Open Door because it has a high concentration of low income families. The Mamaroneck School District assigned a task force consisting of board members and parents to study Open Door’s proposal and to come up with recommendations to help the Board of Education come to a decision. On January 20, 2015, the Task Force presented their recommendations causing different reactions from the community. In November of 2015, the Board concluded that there was a need to hire a third party professional to conduct an objective assessment to study un-met health care requirements for children at Mamaroneck Avenue Elementary School. On February 23rd, School Board President, Ann Lobue, said that they had reached out to Paul Savage, CEO of Healthcare Intelligence, which is part of Iona College to come on board to conduct the third party objective assessment. Savage presented a couple of proposals to two Board committees who asked questions about how he would do the assessment. Mamaroneck Superintendent, Dr. Shaps, explained that the purpose of getting an assessment is to answer whether a school-based health center is appropriate for our community. By the end of the meeting, the Board voted to take Paul Savage’s second proposal which will cost the district $5000. We will continue to follow this story and will let you know when the assessment starts. Sixteen new pay stations have been activated in the Village of Mamaroneck lots. The new parking meters, that were activated this past Thursday, can be found at the Emelin lot, Prospect Lot, Phillips Park Road, Spencer Lot, Hunter Parking Deck and Mamaroneck Avenue. Residents will now have more options available to them when paying. You can either use a credit card or pay using an app called “way to park” on your smartphone. It can be downloaded for free on Apple App Store or Google Play. We want to remind residents that you don’t need to display your receipt in your car, but you should keep it in case you need to add time. Time can be added at any of the pay stations or by using the app. There is a 25 cent surcharge for each transaction on the app. If you want to find out the latest changes in parking, the Village of Mamaroneck recommends that you subscribe to the Village updates at www.village.mamaroneck.ny.us/subscriber. In our Round Table discussion, Mike Witsch spoke with Andrew Spatz, Chairman of the Mamaroneck Village Industrial Advisory Committee and Peter Syrette, Consultant, rePlace Urban Studio about industrial development in our village. The Mamaroneck Ice Hockey beat rival Scarsdale in a playoff game which made our game of the week. Our pet of the week is Matt, a handsome boy, who is about 10-12 months old and weighs 41 pounds. He looks like a Carolina Dog mix but isn’t. He is very sweet but can be shy at times and should be in a home with another dog. Matt is enjoying his new foster home where has foster siblings and can run around the yard with his friends. He is housebroken if kept on a schedule. He sleeps through the night on his foster mom’s bed. He is ready for his forever home. For more information and to browse other adorable pets, go to www.ny-petrescue.org. If you’d like to keep us on the air, support our program by checking out our website at www.lmctv.org. We really appreciate any contribution. 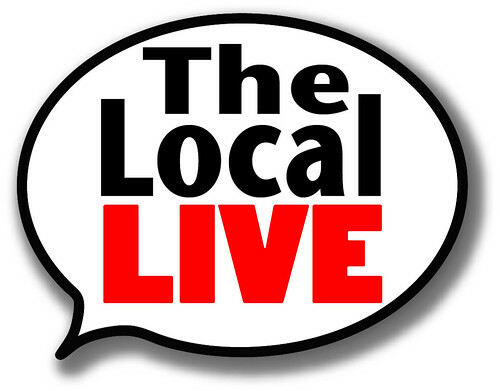 We’re always looking for new interns and volunteers, so send your emails to thelocallive@lmctv.org and join us. We love hearing from you.